On Saturday 19th March, Marist Asia students Niño Memorial and Roque Rebito graduated from the St Alphonsus Theological and Mission Institute, with the degree of Master in Theology in Pastoral Ministry. Both successfully defended synthesis papers as the final requirement for the conferment of the degree. Chris Ganzon, Pat Devlin, Nino Memorial, Roque Rebito, Fritz Arnold, Kevin Stewart, Larry Sabud. Niño’s paper – “Set the Captives Free: Challenging the Penal System” – looked at the situation of prisoners in Davao City, and Roque’s – “Remembering and Forgetting: Memory and Theology” – explored the theological significance of memory. Niño and Roque, along with John Guo Wang, will be perpetually professed in April, and ordained deacons in May. 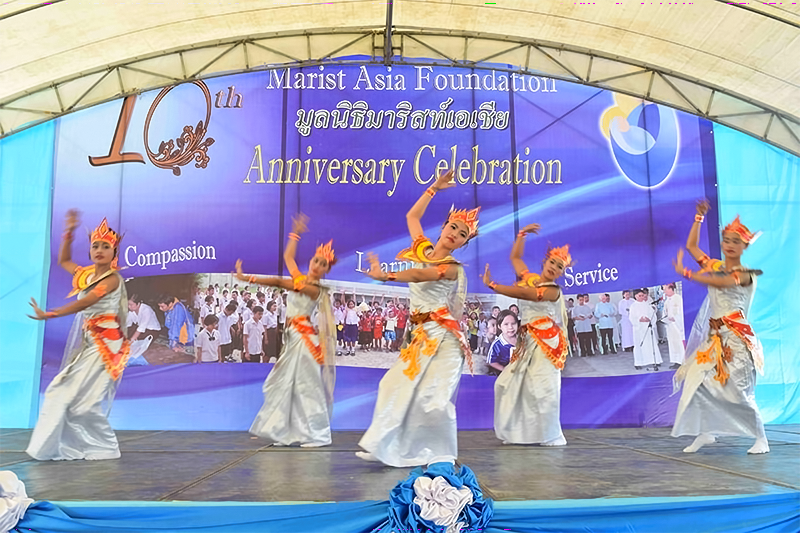 “A fantastic celebration” is how Fr Frank Bird describes the event marking 10 years of the Marist mission in Ranong, Thailand. The two days of festivities on 6-7 February, centred around a big tent where current students, participants in the HIV Aids health project and their families joined together with past and present volunteers and staff to eat, dance and socialise. For many of the student’s parents and participants in the HIV Aids programme it was the first time they gathered in such a scale. Andrew, a volunteer from New Zealand beamed with delight as he had his photo taken with some of his former students, many of whom have become teachers, health workers and are now serving their Burmese Migrant Community. Fr Gil Casio, leader of the HIV Aids Health Project enjoyed welcoming and sitting among many of their patients. “We normally visit patients and their families their homes but the 10 year celebration gave everyone an opportunity to celebrate with their wider community. “There were tears of joy and lots of smiles”, he said. 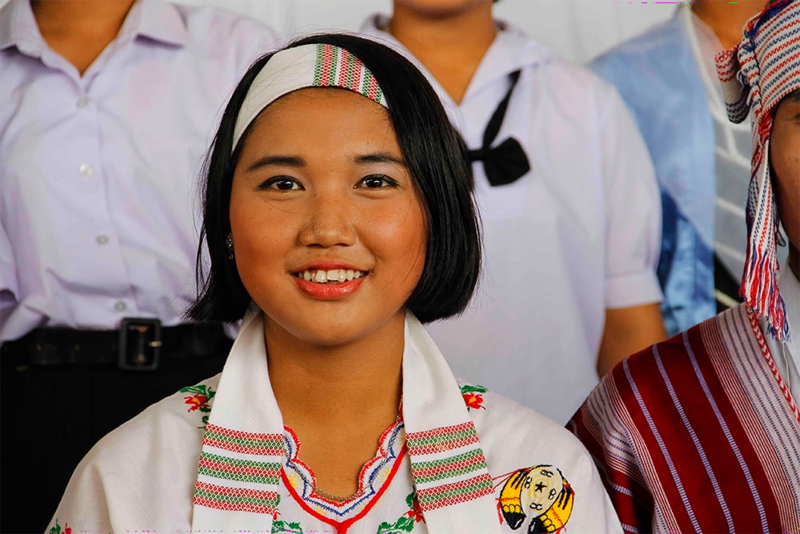 For Frank Bird, leader of the school programme, the highlight was seeing a very poor community dressed immaculately in traditional Burmese clothing performing traditional and contemporary dances and song in front of their parents. “I’ll never forget the joy and pride. “Education brings confidence. Confidence produces beautiful smiles. And the smiles revealed a sense of dignity and pride,” he said. A highlight of the weekend was the Mass celebrated by Bishop Joseph Prathan. The work of the Marist mission has obviously left its mark on him. 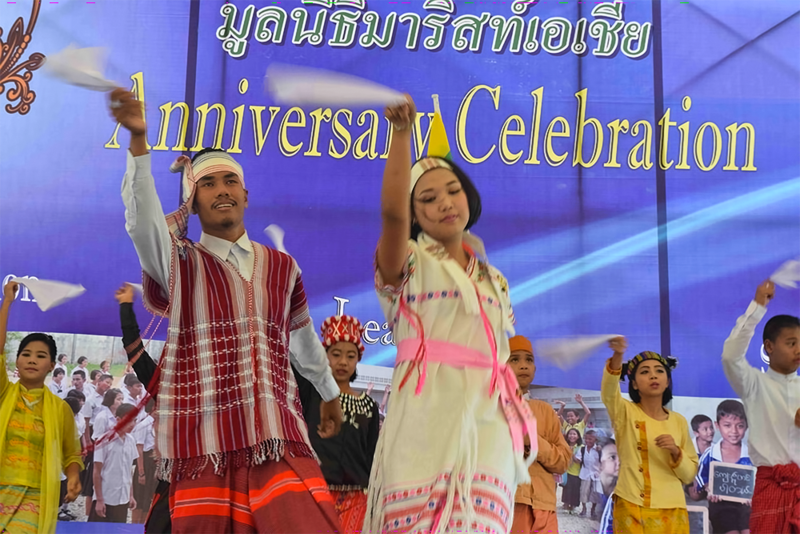 “I am looking forward to returning to celebrate 20 years of the Marists in Ranong!”, the Bishop said in the course of his homily. During Mass special prayers and thanks were offered for all the friends and funders; without whom the work could not have begun nor continue. 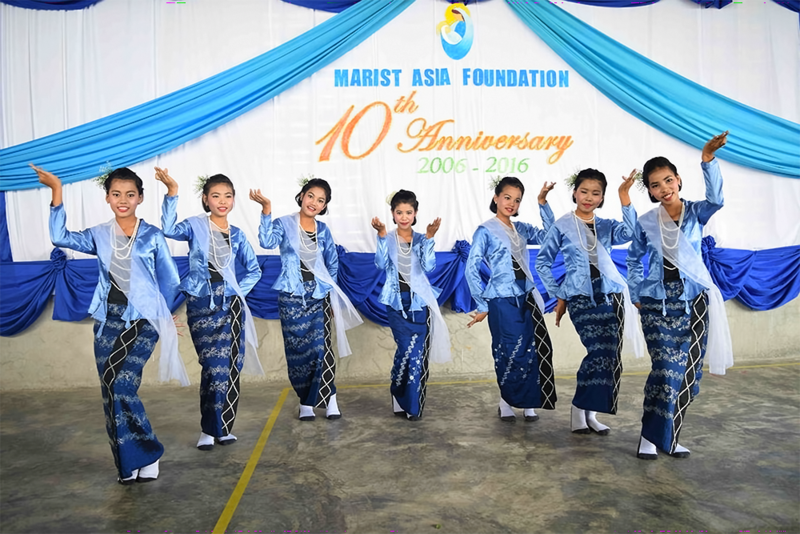 The mission started in 2006 when the Marist District of Asia acted in response to the needs of the Burmese refugees and migrant workers in Thailand who live in difficult conditions. The mission has been staffed by Filipino and New Zealand Marists, and numerous lay volunteers from around the world. It has been generously funded by the likes of the New Zealand Marist province, the Marist District of Ireland, the Marist Mission Office in Australia, the Society of Mary’s general mission fund, Caritas, Misean Cara and many individual sponsors and charitable organisations. The 2013 Council of the Society of Mary meeting in Dublin instructed the New Zealand and Australian provinces to work more closely. More particularly, the 2013 Council asked each province to investigate how to go forward with a possible reconfiguration. In March 2015, a joint two-day meeting of the Australian and New Zealand provincial councils was held in Wellington, and among other things, this initial meeting nominated a ‘small committee’ to work on choosing important elements to be included in the ‘framework’ that would eventually be incorporated in a “model” of a new single province that would be proposed to the Marists of Australia and New Zealand for acceptance. Following on from the March provincial councils’ meeting, the small committee of Fr Peter McMurrich (Australia), and New Zealanders Frs Paul Martin and Tim Duckworth, met last week in Wellington. New Zealand Marist provincial, Fr David Kennerley said one of the small committee meeting outcomes is to ask the Marist Asia District to consider joining a reconfigured Australia – New Zealand province. Saying a reconfigured Australia and New Zealand province will not deliver utopia, Australian Provincial, Fr Bob Barber SM outlined are some key elements to the framework. seeing that our structural changes will facilitate the continuing our Marist mission within our prioritised works in a focussed way”. Optimistic, Fr Barber is of the view there is no reason to fold our tents and stop working to have a future that continues to be mission oriented. Both the Australian and New Zealand provinces have a strong association with District of Asia. Founded in 1981, the Marist Asia District has 11 Marist priests working in the Philippines and Thailand. Currently New Zealander, Fr Pat Devlin is the district leader, while fellow New Zealand Marists Frs Frank Bird and Damian Dempsey are also working in the District. Fr Bird works in the education ministry of the Marist Asia Foundation in Ranong, Thailand, and Fr Dempsey works in the Marist formation ministry in the Philippines. The District has 3 young men in Marist formation and a further 13 who are interested in Marist life. The District of Asia, and Provinces of Australia, New Zealand and Oceania are already part of the informal Marist Asia Pacific (MAP) meeting that meets annually to discuss matters of common interest and the sharing of resources. Marist provincials and vicar provincials from Australia, New Zealand and Oceania, the District Superior of Asia, along with Vicar General Larry Duffy and the Council of the Oceania Province. Suva, Fiji. 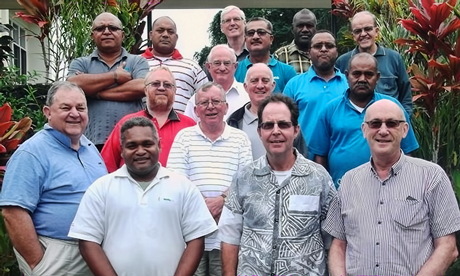 The Marist provincials and vicar provincials of Australia, New Zealand and Oceania, along with the district superior of Asia, (MAP), and Vicar General of the Society of Mary, Fr Larry Duffy SM met recently for two days in Suva, Fiji. The meeting was again considered very successful. a discussion on how the reconfigured framework would look if Asia were included in the reconfiguration. Among the decisions taken was agreement on a combined MAP Skype conference in September to follow up on the issues of reconfiguration and restructuring. 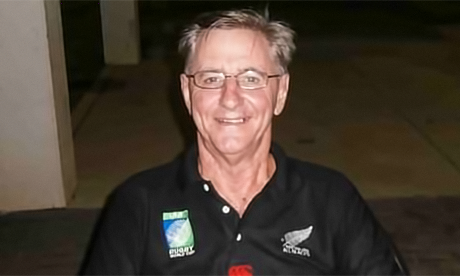 Former New Zealand Marist, Gavin Foster, has elected to join the Australian province of the Marist Fathers. Ordained in New Zealand, Gavin worked in his native country for a number of years before volunteering to serve the Asian mission in the Philippines. After 20 years in Asia working as a formator, CPE supervisor, psychologist at the diocesan seminary and a chaplain for mental patients at Davo’s Psychiatric Hospital, Gavin was offered a years sabbatical study in Sydney. Gavin’s transfer from the District of Asia took effect on 24 September. He is continuing his ministry as full-time chaplain at St Joseph’s College, Hunters Hill. 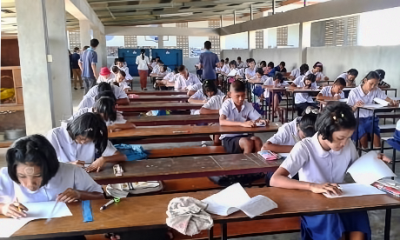 The Marist mission in Rangong, Thailand has more students than ever! Recently the mission attracted 67 students to sit the entrance examination to permit those successful to enter the Burmese Migrant Secondary Education Programme. Director of the mission, Fr Kevin Medilo is viewing the increase positively. “This is a great number and a great sign that Burmese families are really wanting to support their teenagers in continuing with education”, he said. 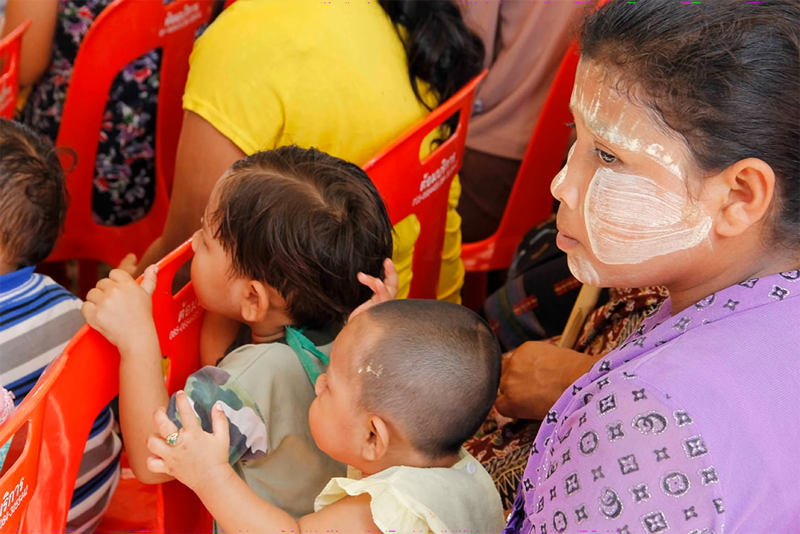 Normally in Ranong 90% of Burmese migrant children leave education around 11 years of age. Fr Medilo says that sometimes children follow their parents into dangerous work in a fish or charcoal factory, but that educating these students is helping break the cycle. Frs Pat Devlin, Damian Dempsey and Frank Bird are New Zealand Marists working in the Marist Asia mission.